I did the Sleep Out. 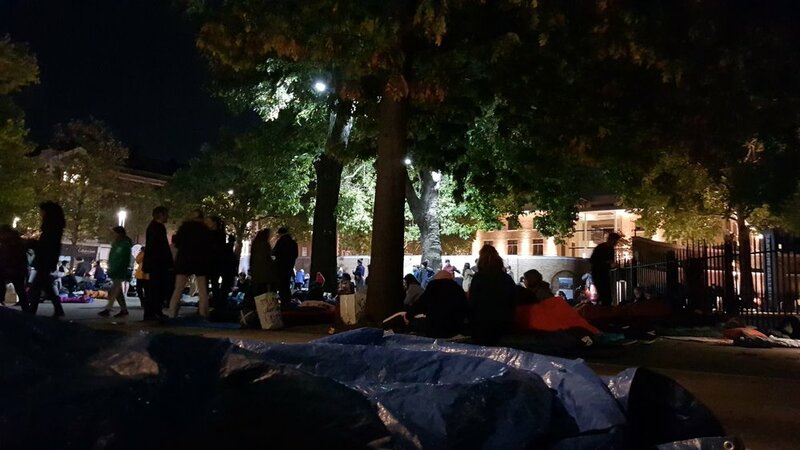 And it was actually OK.
On Friday 6th October, almost 400 people bedded down for the night in Duke of York Square in Chelsea to raise money for Glass Door who coordinate the night shelter which St Peter’s help host over the winter. To date we have collectively raised over £135,000 with more sponsorship to come in. It was a good night for it – in fact, one of our participants chose not to sleep because ‘it would have been a waste of a beautiful night’. Cloudy, dry, low wind, a late sunrise and temperatures set to drop to only 10°C. There was no frost, rain, snow or gales which many homeless people have to battle against sleeping out all year round. I chose my clothes carefully, lots of thin layers and spares in my bag just in case. The kit all fitted me and I hadn’t spent the last several weeks wearing it. It was freshly laundered, without holes or rips, and fit for purpose. I packed my bag around 8pm before leaving to meet the team. We met at church to pray and encourage each other, and to pick up a few final bits of cardboard to help us sleep. Someone gave me a lift to Chelsea and we arrived really early, plenty of time to pick out a quiet, sheltered spot next to a wall, away from the lights and not too close to the busy areas serving hot drinks and snacks (thanks Graze and Pret!). We were safe, the site was secure and clean toilets were readily available. There was a jolly vibe to the evening, people arriving and catching up with each other, many people clearly quite excited to be on a mass outdoor sleepover. We briefly regretted not bringing a pack of cards, but soon I felt ready for some sleep. I was tired, but otherwise physically and mentally well. I was not suffering from a lifestyle of rough sleeping, nor from any underlying conditions which contributed to being vulnerable enough to need to sleep outside in the first place. I was not under the influence of drink, drugs or medication. I felt safe, my bedding was set up between friends from St Peter’s and a nice lady called Annie who I’d just met who but goes to another church I’d heard of. My sleeping bag, blanket and roll mat were clean and dry. I fell asleep quickly around 10.30pm, and slept for over an hour. When I next woke up it was approaching midnight and my feet were cold. My feet get cold easily, and I probably could have slept through the (very slight) discomfort, but as I had extra layers I did a quick change – another pair of trousers, upgraded my waterproof jacket for a woolly jumper and wrapped the legs of my sleeping bag in my plastic survival bag. More people were starting to get to bed, there seemed to be a shift in the conversations from being noisy and excited to complaining about the noisy and excited people. I got back to sleep pretty easily, not kept awake by cold or hunger, not disturbed by rain, not concerned by those around me. I slept for another 4 hours or so with a bit of tossing and turning until I was woken by a jolly man with a Canadian accent and the smell of bacon sandwiches (thanks Partridges!). At no point in the night was I worried about the safety of my belongings, at no point was I at risk of violence or sexual assault. We packed up quickly, shared notes on our nights, waved and smiled for the survivors photo, recycled our cardboard, picked up some more snacks and headed home. Arriving home around 6am I found that my bed had been taken in my absence by a two year old. I opened out our sofa bed and slept for a few more hours before enjoying my rice crispies and a cup of tea for breakfast. I have a house with beds and blankets, I have a supportive family, and I work flexibly so I could give myself enough space to recover from a night outside. I was not turfed out of my bed to be moved on elsewhere, and wasn’t struggling to find food I could afford and somewhere warm to spend the day, and the next night. I did the Sleep Out. It was actually OK. It was a sacrifice for me and a step of faith, and I’d love it if you could sponsor me for doing it, but it was actually OK. The reality for thousands of men and women across this country who have no home is quite different. Homeless people will sleep out in all weather over the coming months, at risk of crime and illness, and some will not survive this winter. If you would like to help them you can donate to Glass Door, get in touch with us about volunteering at the night shelter, or join us on the Sleep Out next year.